The house mouse varies in colour from white to grey to light brown to black. An adult body has a length of 7.5 cm – 10 cm and a tail length between 5 – 10cm. It has quite large ears, a pointed nose and small eyes. They are erratic, sporadic feeders and will consumed about 3g of food each day from many sources rather than taking repeated meals from any one food item. They do not need water, as they obtain sufficient moisture from their food but can however drink up to 3ml of water daily. Although they eat all types of food they do show a preference for cereals. On average they will have 7-8 litters a year, with a litter size of 4-16 (average 6-8). The young are born blind, hairless and completely dependant on their mother, they grow rapidly and are weaned at 3-4 weeks. 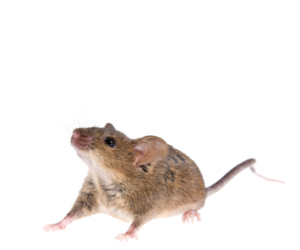 Also know as the wood mouse or long tailed field mouse, the field mouse has sandy brown fur which goes darker towards the spine and a white/grey underside. They have protruding eyes, large ears, a long tail measuring between 7–9.5 cm and a body length of approximately 8–10cm and weigh between 13–27 g.
The young are greyer overall, but still have much longer ears, hind feet and tail than house mice.They will have a litter size of between 4-7 between the months of March to October, however autumn litters are smaller. The young are born blind and hairless and are weaned at 18-22 days of age when their weight is about 6-8 grams. Growth in the summer is rapid and females can become pregnant when they have reached a weight of 12 grams. Breeding may continue over the winter if a good food supply. They will feed of fruits, seeds, green plants and animal foods, within a woodland they eat acorns, ash and sycamore seeds for most of the winter, buds in early spring, caterpillars, worms and centipedes in early summer and blackberries and fungi in the autumn.